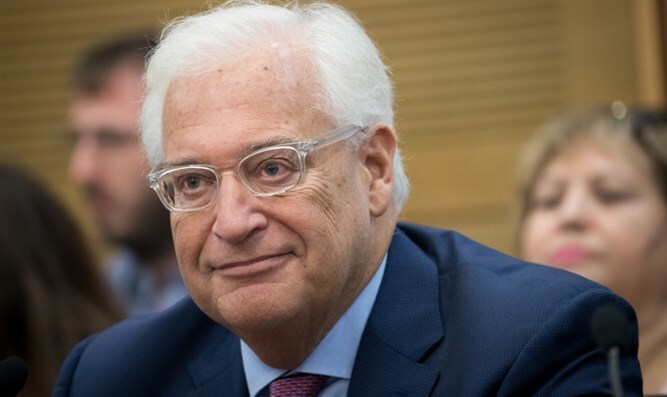 US Ambassador to Israel David Friedman has sought to refer to Judea and Samaria by their biblical names in his official statements and documents, the Associated Press reported. According to the report, Ambassador Friedman has been prevented from using the names Judea and Samaria by the Trump Administration. Judea and Samaria formed the heart of biblical Israel. Judea received its name from the tribe of the Davidic dynasty which ruled the southern kingdom from approximately 1000 BCE until 586 BCE, the tribe of Judah. The Jewish people are largely descendants from the inhabitants of the Kingdom of Judah. Samaria received its name from the Samaritans, who were brought into the land by the Assyrian Empire to replace the exiled inhabitants of the northern Kingdom of Israel. A population of Samaritans still resides in Samaria over 2,500 years later. Judea and Samaria are known internationally as the 'West Bank,' a term given to the land by the government of Jordan after Jordan illegally occupied the land in 1948. Senior officials told the Associated Press that Ambassador Friedman had pushed for the removal of the term 'occupied' when referring to land captured or liberated by Israel in the 1967 Six Day War. Last September, Ambassador Friedman stated that he believes Jewish communities in Judea and Samaria are part of Israel. "I think the settlements are part of Israel,” Friedman said in an interview with the Hebrew-language Walla website. “I think that was always the expectation when Resolution 242 was adopted in 1967. It remains today the only substantive resolution that was agreed to by everybody,” he added.